Our Set 4 Pondless fountain with 1200mm spray ring is designed to be a complete spray ring feature package, with dancing capabilities and EGC wireless control. An Aquarius Eco Expert 44000 Water Feature Pump. A 140cm underground resevoir with Grid. An FM Master WLAN EGC Controller. A 1200mm Spray Ring Connection Kit. Catchment area liner 5m x 5m. Our Pondless Fountain Spray Ring Feature is supplied with an Aquarius Eco Expert 44000 pump. Place the supplied end cap onto the 3 way distributor to convert this into a 2 way flow distributor. Screw the 2 way distributor into the 2"to 1" reducing bush. Push a length of hose onto each of the hosetails on the 2 way distributor making sure you secure the hose to the hose tail with a hose clip. Place a hose clip onto each length of hose ready to attach to the spray ring inlets. Screw both 1" hose tails into the spray ring inlets. Dig a circular hole that measures 140cm in diameter and around 15-20cm deeper than the top water reservoir depth. Skim the top soil layer around the reservoir hole so that water landing outside of the reservoir will naturally run back to the reservoir by gravity. Place your reservoir in the hole and fill in any gaps around the edges with sand (Make sure the reservoir is level with the ground). Using the protective underlay, lay this up to the edge of the reservoir on dry land but not beyond the top rim. The underlay is designed to protect the pond underlay from stones and root penetration. Place your 5m x 5m pond liner over your reservoir making sure the reservoir is central under the liner. Cut a circular hole in the liner that is around 12” smaller than your reservoir, so that the liner is well inside the reservoir rim. This hole will allow the water to easily return to the central reservoir. Using a piece of sandpaper, rough up the surface around the top lip of the reservoir ready to bond the liner to it. Clean off the lip to remove any residue or debris. Place two circular beads of pond liner sealant all the way around the edge of the reservoir, then carefully stick the liner to the reservoir making sure there are no air gaps. Use a wallpaper roller, rolling pin or fizzy drinks can to gently press down the sealant around the perimeter of the reservoir. Allow the adhesive to cure. Place your Aquarius Eco Expert 44000 Pump in the centre of your reservoir. Attach your spray ring flow controller connection to the top pump outlet. Place your pond overlay over your pond liner and reservoir, making sure to leave a hole for your spray ring connections to protrude. The overlay material will prevent damage on the top side of the liner when your decorative stones are added. Place the galvanised steel grid over the top of your reservoir. Place your spray ring onto the steel reservoir grid. Attach your pump flow controller connections to your 1" hose tails on the spray ring. 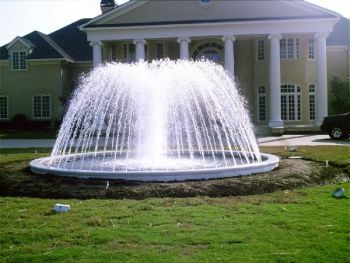 Apply power to your fountain for testing and set to the desired water display height. Once the fountain has been left running and account has been made for splashing, cut the outer perimeter of the liner to the final size required, ensuring that you do not cut inside the splash zone. Place your decorative stones around the fountain nozzle covering the reservoir grid and pond liner. If your decorative stones are smaller than the grid holes, use chicken wire and/or a weed membrane to reduce the hole sizes to prevent the stones falling into the reservoir. Top the reservoir back up with clean water. Apply power, sit back and enjoy your new pond less water feature.